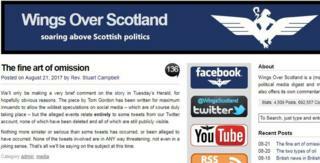 The pro-independence blogger behind the Wings Over Scotland website has been arrested for alleged online harassment. Stuart Campbell was arrested in the west of England on Friday following a complaint from a woman in south London. She had made allegations of harassment taking place over a two-year period. Mr Campbell, who was released on bail, said it concerned some tweets and insisted they were not threatening. He accused the media of "innuendo" designed to encourage "speculations". The blogger, a former computer games reviewer who was born in Stirling but lives in Bath, has been a vocal campaigner for Scottish independence and launched the Wings Over Scotland blog in 2011. On Friday he tweeted that he would be posting less frequently than usual because of "reasons totally outwith my control (don't ask)". For sucky reasons totally outwith my control (don't ask), posts on Wings will be very sparse for an unknown period. Sorry, folks. A spokesman for the Metropolitan Police said: "Police are investigating an allegation of online harassment. "The allegation was made after a woman, aged in her 30s, attended a south London police station. The harassment is said to have taken place over the past two years." Mr Campbell has been bailed, pending further inquiries, to a date in mid-September. In a statement on the Wings Over Scotland website, Mr Campbell responded to a report of his arrest which appeared in The Herald newspaper. He said that piece "has been written for maximum innuendo to allow the wildest speculations on social media - which are of course duly taking place - but the alleged events relate entirely to some tweets from our Twitter account, none of which have been deleted and all of which are still publicly visible. "Nothing more sinister or serious than some tweets has occurred or been alleged to have occurred. None of the tweets involved are in ANY way threatening, not even in a joking sense. That's all we'll be saying on the subject at this time."